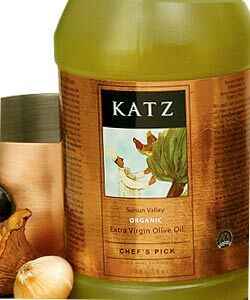 KATZ Chef's Pick Organic Extra Virgin Olive Oil is the olive oil of choice for many of the finest restaurant kitchens and their chefs...who often help us harvest this oil each year...thus the name! Enjoy our special "food service for the home chef" size...a carefully crafted blend of oils harvested from our organic olive groves in the agriculturally rich Suisun Valley (on the eastern border of Napa). It's the olive oil used at the famous Chez Panisse Restaurant and Cafe in Berkeley, California; it promises to become a staple in your kitchen as well.